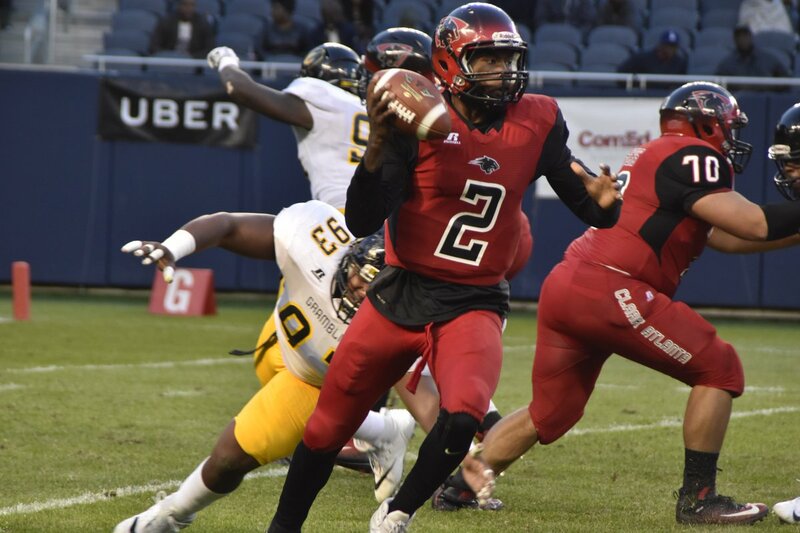 Despite accumulating over 400 yards of total offense, turnovers would plague the Panthers, resulting in a 20-31 loss to Grambling State University in the 20th Annual Chicago Classic. The Panthers were the first to score. Tailback Roger Thomas advanced the ball deep into Grambling territory, but the drive would stall after consecutive incomplete passes by quarterback Johnathon McCrary. Kicker Carlos Saldana put the Panthers on the board with a 29-yard field goal. Late in the first quarter, GSU starting quarterback Geremy Hickbottom would be replaced by 2017 SWAC Preseason Player of the Year Devante Kincade. On Kincade’s first pass attempt of the game, he found wide receiver Darrell Clark for a 23-yard touchdown. The next time Kincade touched the ball, he threw another touchdown pass – this one for 59 yards to tight end Jordan Jones. A 25-yard field goal by Marc Orozco pushed the Tiger lead to 17-3. McCrary appeared to get the passing game on track on the Panthers’ next possession. He hit Deandre Jackson with a 43-yard strike, and then followed that play up with a 36-yard connection to tight end Rodney Morris. Three players later, Jackson caught an 11-yard pass for a CAU touchdown, trimming the Grambling State lead to seven. Panther Nation became livid in the closing moments of the second quarter. Receiver Johnathan Sanders appeared to reel in a touchdown pass, only to have the referees rule the pass attempt incomplete. However, replay of the catch on the jumbo video board clearly demonstrated that Sanders made the catch, and got one foot down before going out of bounds. The Panthers coaching staff would protest, but ultimately had to settle for another Saldana field goal, resulting in a 17-13 halftime lead for the Tigers. After the break, Grambling State went right back on the attack. On the third play of the drive, Kincade threw his third touchdown pass, this one to receiver Devante Davis. McCrary’s second interception gave the Tigers the ball at their own 35-yard line. Kincade drove his team down the field with consecutive completed passes of 39, six, and 23 yards. On the next play, receiver Lyndemian Brooks rushed for a two-yard touchdown and a 31-13 lead over the Panthers. CAU’s Jackson caught a second touchdown in the fourth quarter, but the clock would expire a minute later, giving Grambling State the 31-20 victory. McCrary completed 23 of 55 passes for 371 yards and two touchdowns, but also threw four interceptions. Jackson caught eight passes for 129 yards and two touchdowns.